Whitetail Inn - A peaceful vacation retreat! 3 Bedroom, 2 1/2 bath sleeps 6: no pets/nor smoking allowed. There is wildlife in abundance and peace and quiet. 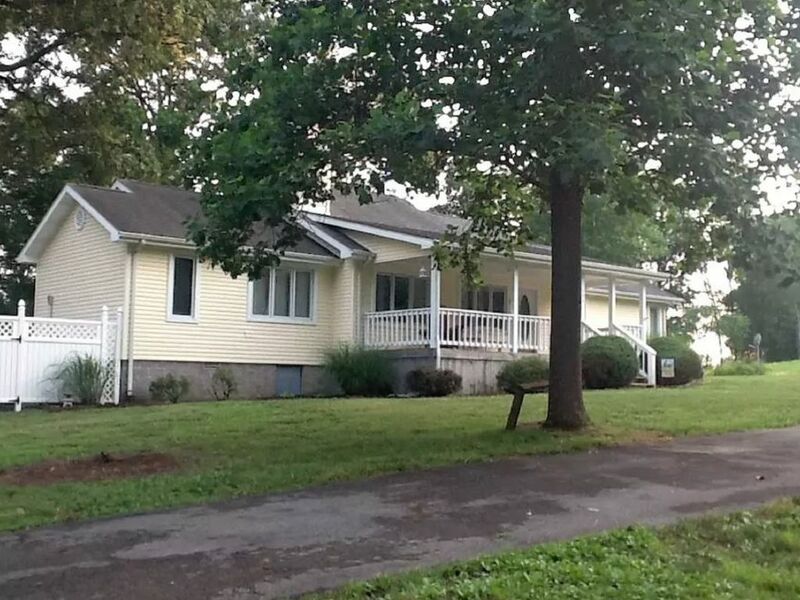 We have a large deck, open kitchen, covered porch and lots of parking. Our private dock is available nearby across the road. We are located in a park setting near Land Between the Lakes Recreation area. For an additional fee we offer private kayak rentals; historical tours and soon will add sailing, trips, too. If you come to visit our beautiful paradise you will not be disappointed. Guests have the use of the entire house including large decks and porches. There is plenty of parking space and easy access to major roads even though we seem to be tucked away from it all. Internet and WIFI are available. Our kitchen is stocked with dishes, silverware, utensils, pots and pans and appliances. Lake Barkley State Resort Park is about 6 miles away. It has a Convention Center, a fitness center with indoor pool, AirNav: 1M9 - Lake Barkley State Park Airport, Boots Randolph Golf Course. In less than a mile away a Dollar General, liquor store, and gas station. The historical town of Cadiz is 10 miles away and has several antique shops, and restaurants. Larger shopping areas within 35 miles are Murray and Hopkinsville KY. The largest airport is in Nashville about an hour and a half away from Whitetail Inn. Our name is based on the fact that there are often white tail deer on the property as well as many forms of wildlife. Boats are welcome and we have plenty of parking. There is a public boat launch nearby and visitors may use our private boat dock at our own home across the road from the Inn. Civil War buffs will find Fort Donaldson in Dover TN a short drive away and has a museum with videos of the history of the area. The Land Between the Lakes is about 2 miles away and offers many opportunities for daytime excursions. The 1850's Homeplace, a planetarium with lazer shows, bike and hike trails, and more. toilet, combination tub/shower, tub, jetted tub, Whirlpool Tub! toilet, Guest bath with vanity. off street parking for boats and trailers. Modern open kitchen features stainless Steel appliances. Great Island with range and a side for stools. Very nice home in a quiet neighborhood. This house was amazing! We had a wonderful vacation. There was plenty of room for our family to spread out. The house includes a huge sun porch that was perfect for eating meals or an evening card game. Great visitors! We were so happy to learn that they had explored the Elk and Bison Prairie in the Land between the Lakes near by. It is such a pleasure to be able to host family reunions like this one. These two sisters and their husbands came from Iowa and Georgia and met here in the middle! Very nice home and surrounding property, would definitely recommend. This was our first time renting a house and what a great house we found.We had 5 adults in our mini family get together and had lots of room. The house was close to all the fun things we wanted to do and was easy to find. Toni the host was friendly and fun to talk to.Thank you Toni for a wonderful house and well maintained house. We are so glad you enjoyed your stay! Next time you must go kayaking , too, on our gorgeous bay. A very relaxing place to stay! My wife and I very much enjoyed our 4 night stay. We used the kayaks nearly every day, and appreciated the other nearby attractions, such as: jet ski rentals, horseback riding, hiking, biking, swimming, and antique shopping. We would highly recommend this quiet property, just across the road from the lake, and we will likely stay here again on our next visit to the lake. There are indeed many things to do nearby. Among them is also a Planetarium, 1850 Homestead which features period costumed folks going about the daily activities of that time period. The small town of Cadiz is only 10 miles away and Main Street features many antique stores as well as the Janice Mason Art Museum. We had a great stay at the home in Cadiz and Toni was very helpful as we neared that stay as well as during the stay. The home was awesome as it was beautiful. Tom and his guests were super visitors! They left Whitetail Inn neat as a pin. I am so glad they had an opportunity to visit our beautiful area and enjoy the boating and swimming in Lake Barkley. Excellent Home, Great Location if you are looking for quite private cozy home. Huge yard, boat ramp about a 2 minute drive. Fishing was very good at mouth of creek. Fish are all over bridge pillars right now along with millions of moths. Lol love the week there will be back.